Whenever something good happens, I celebrate with cake! 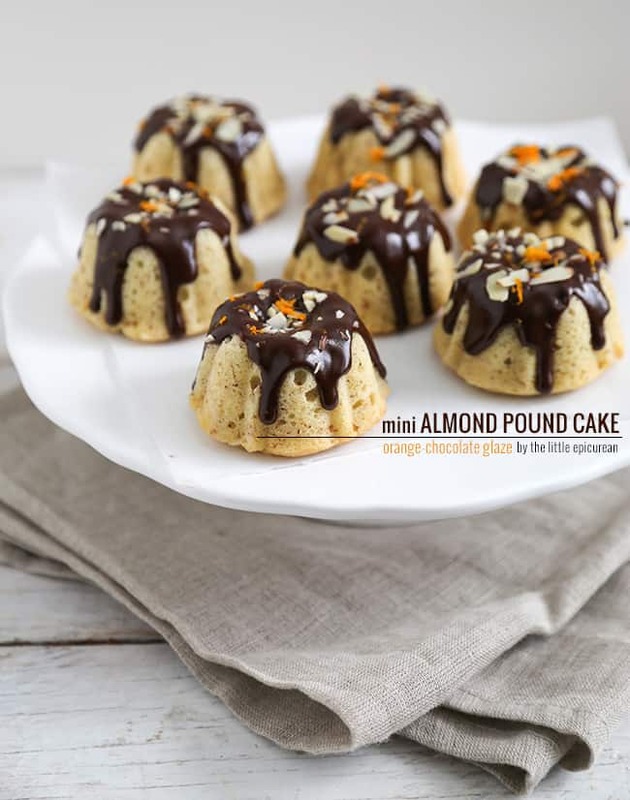 I made these mini almond pound cakes with orange-chocolate glaze to commemorate my new site design! I thought about making a crazy over the top cake, but I restrained myself. I’ll save that monster of a cake for my blog-anniversary coming up next month. Last weekend when I drove to Indio for Coachella, I stopped by Hadley Fruit Orchards in Cabazon. I was there to get my obligatory date shake fix, but secretly I was also there loading up on nuts and dried fruits. I bought a lot of raw almonds, almond meal/flour, and stocked up freshly ground peanut butter (made to order!). With all these almonds in the house, it was time to start baking them this week. I love almond pound cakes. Pound cakes are my favorite because they are so dense and jam packed with flavor and goodness. Rather than make a large pound cake, I opted to use these mini bundt cake pans. In my opinion, cute little individual desserts always reign supreme over larger scaled desserts. Melted chocolate is a wonderful thing. It can take something already delicious and make it unforgettable. 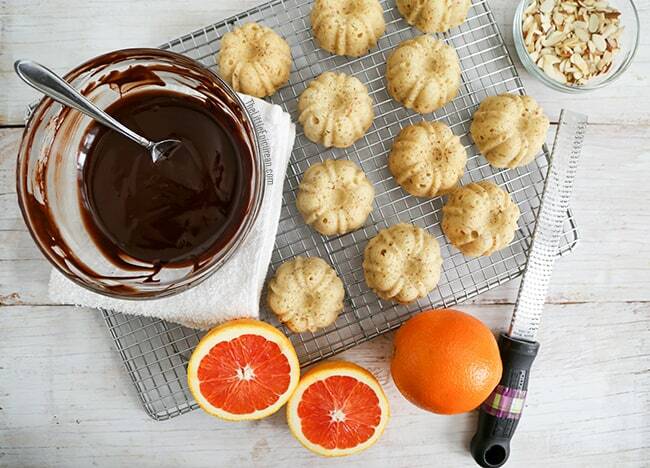 I lightly drizzled some melted chocolate over the cooled mini cakes and sprinkled orange zest and sliced almonds on top. Try not to go overboard with the chocolate. 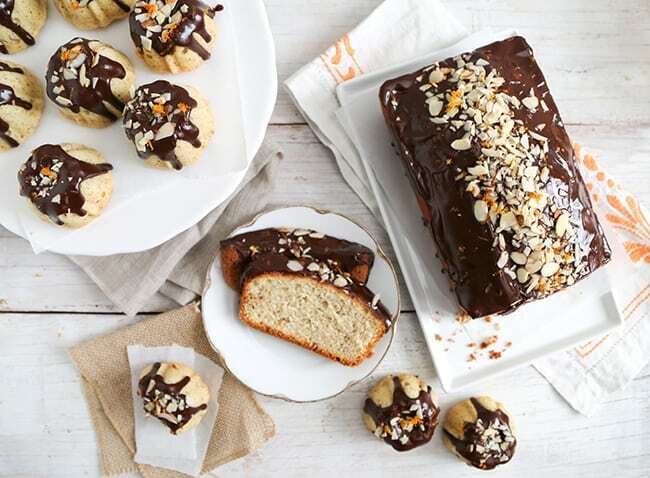 The mini almond pound cakes look so much more alluring when you are able to see the cake peaking through the chocolate. Preheat oven to 350 degrees F. Generously butter mini cake pan and a 9"x5" inch loaf pan. Lightly flour and set aside. **. In a large bowl, whisk together almond flour, all-purpose flour, baking soda and salt. Set aside. Add eggs one at a time, making sure each egg is incorporated before adding the next. Add vanilla and almond extract. Mix. Add 1/3 of dry flour mixture. Mix on low speed until almost combined. Add 1/2 of yogurt. Mix until almost combined. Repeat and end with 1/3 cup dry flour mixture. Mix until there are no longer any dry streaks of flour. Fill mini cake pan 3/4's full of batter. Use the remaining batter to fill loft pan. Use a mini offset spatula or the back of spoon to even out batter. Bake for 35-40 minutes. Check mini cakes for doneness by inserting a toothpick in center of cake. Toothpick should come out clean. Alternatively touch the top of the cake, it should spring back when touched. Loaf pan should take a little more time, bake for 50-55 minutes. Let cakes sit in pan for 3-5 minutes to cool slightly and then unmold. Allow cakes to cool to room temperature on wire rack. Over a double boiler (bain-marie), melt together chopped chocolate and butter until smooth. Alternatively, you can microwave it at half powder in 30 second intervals until melted. Remove from heat and whisk in corn syrup. Spoon glaze over cooled cakes. Immediately sprinkle orange zest and sliced almonds on top. Let sit for 5-10 minutes to set. 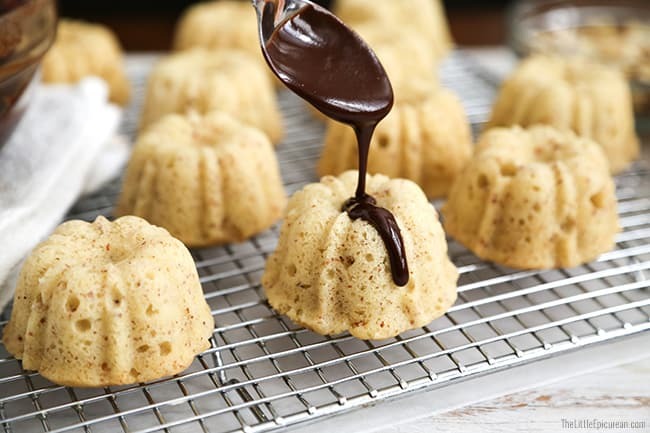 ** This recipes makes for 24 mini bundt cakes (mini cakes) or two- 9"x 5" loaf pans. Mix and match. 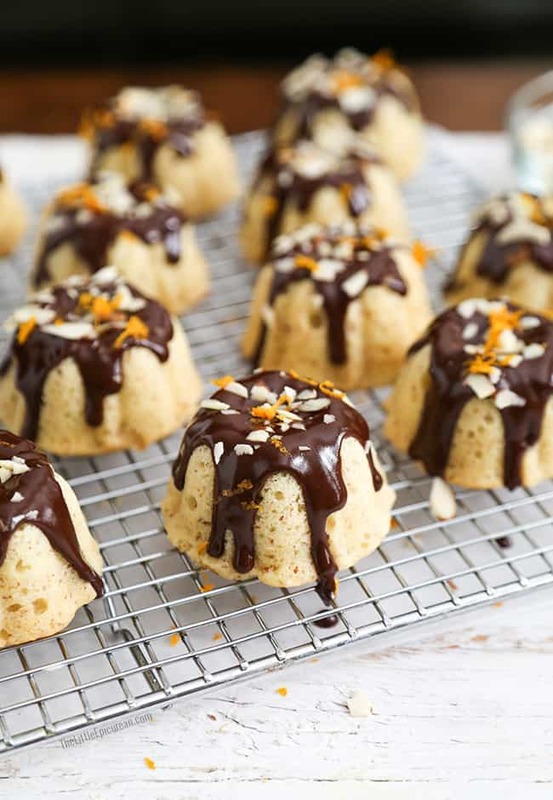 You can even use batter to fill one large bundt pan. Check for doneness and adjust times according to what mold you choose to use. I also loved Hadley’s and its date shake. I loaded up on dates, nuts and soy beans last Saturday, can’t wait to make the date shake at home! 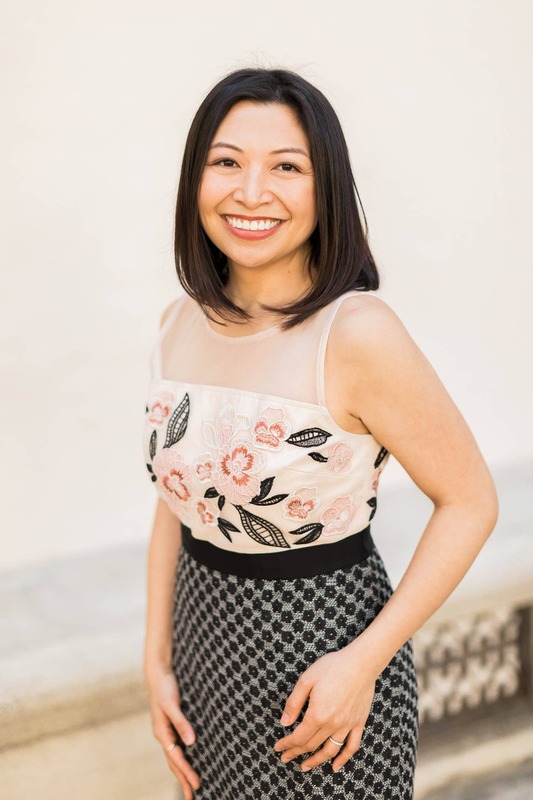 Love the new site Maryanne! Your pictures are beautiful. Thanks Immaculate! How are you? !